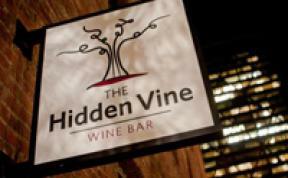 Opened in 2005 in a hotel alcove, The Hidden Vine, which moved to the Financial District in 2011, serves wine from around the world and seeks to educate their patrons on the beverage they are partaking in. Known for its "warm and unpretentious" environment, customers can choose from over 140 wines, 40 of which are available by the glass, with the help of a knowledgeable and famously friendly staff member. Each month, the bar focuses on a different wine-making region. They also serve food with seasonal, organic ingredients and have a bocce ball court.